Certain films, from Fritz Lang’s Metropolis (1926) to Woody Allen’s Manhattan (1979), are as much about the cities in which they are set as they are about the plots they narrate and the characters they create. It could even be said that the city is the main character of these films. Human characters are secondary, in that they are defined by the city, representative of the city and in many cases metaphors for the city. Bob Rafelson’s The King of Marvin Gardens (1972) and Louis Malle’s Atlantic City (1980) cast Atlantic City, New Jersey in the role of central character. Possessing a unique spatiality, Atlantic City is further defined by the two films’ distinct temporality: the beginning and end of the 1970s. Even before it became the East Coast’s Las Vegas, Atlantic City stood apart from other beach resorts in its singular traditions and identities (the famed and seemingly endless boardwalk, the Miss America pageant, and the homage bestowed by the Parker Bros.’ boardgame Monopoly.) It is difficult, if not impossible, to imagine these films’ stories set in any other location, nor during any other time than the 1970s. Most fascinating is each films’ narrative characterizations as they reflect and are shaped by the Atlantic City setting. The King of Marvin Gardens was Bob Rafelson’s melancholy, mature follow-up to the irreverent debut features which had launched his career, Head (1968) and Five Easy Pieces (1970). Jack Nicholson plays the emotionally aloof David Staebler, host of an AM talk radio program, who is lured from his bleak Philadelphia existence to the wintry off-season of pre-revival Atlantic City by a promise from his grifter brother Jason (Bruce Dern) that, ‘Our kingdom has come.’ David is greeted at the railroad station by Jason’s companion, the aging beauty Sally (Ellen Burnstyn) and soon after is reunited with the dangerously charming Jason, behind bars at the Atlantic City lock-up on petty theft charges. Jason implores David to seek bail from Louis (Benjamin ‘Scatman’ Crowthers), a local racketeering boss. Upon arriving at Louis’ stately beachfront home, however, David becomes uneasy when he interrupts several sinister-looking men conferring in low tones and so departs, only to find Jason magically sprung from jail and roaming the boardwalk with Sally and her beautiful step-daughter Jessica (Julia Anne Robinson) in tow. Taking up residence in one of the decaying palatial hotels along the boardwalk, Jason reveals to David his scheme to acquire a tiny Pacific island called Tiki, with the purpose of developing an opulent offshore gambling paradise. He requires the help of the respectable David, who initially seems completely lacking in business finesse, to reassure Japanese investors to put up the remainder of capital allegedly being fronted by Louis. Over the next two days, David is drawn into Jason’s deceptive web of shady financial dealings amid Atlantic City’s underworld. Strangest of all is Jason’s relationship with both women, a dangerous concoction of deviant family circle and doomed love triangle. Alone in the hotel room one evening, David is accosted by two thugs and delivered to Louis, who warns that his influence will return Jason to jail if he overreaches himself again. Undeterred by this warning and still clinging foolishly to his plans for paradise, Jason makes a last-ditch effort to persuade David to accompany him west. No longer swept away by his brother’s blue-sky exhortations, David pleads with Jason to wake up to reality. Yet, in a sudden and shocking interruption, Sally – driven to derangement upon seeing that Jason intends to abandon her in favor of the youthful Jessica – brandishes a gun and shoots him. The film culminates with David carrying his brother’s remains back to Philadelphia, where in the final image a home movie shows the brothers as children, at play on a beach vacation. Sally angrily turns them away, saying ‘I’m not taking care of either of you this time.’ But Dave, who has just intercepted a Mafia drug conveyance in Philadelphia, bullies Sally into letting them stay and strikes up an acquaintance with old-timer Lou, whom he flatters into fencing the stolen cocaine. When the burned dealers discover Dave and kill him in a harrowing scene atop a moving parking deck, Lou is left with the loot. Meanwhile, when her marriage to the deceased criminal Dave is discovered, Sally is fired by the casino and disgraced by her would-be sugar daddy Frenchman (Michel Piccoli). Guilt-ridden, Lou befriends Sally by handling the funeral arrangements and charming her with an expensive dinner. After he confesses to watching her through his window, Sally gives herself to Lou in a gesture midway between generosity and pity. Soon after, the two dealers trash Sally’s apartment in search of their missing stash, and then viciously attack her in the street. Lou shoots both men and – giddy with pride at having protected Sally – takes her along as he heads out for Florida. But in a motel room along the way, Lou watches regretfully as Sally sneaks out with a chunk of the loot, leaving him to return to Atlantic City and enlist Grace in selling off the remaining dope. The film closes on the older couple, arm in arm, strolling jauntily down the boardwalk. Writing in 1970, a New York Times reporter disparagingly termed Atlantic City’s boardwalk ‘The Great Wood Way,’ noting its ‘peculiar admixture of crass vulgarity, rampant commercialism, and vestigial gentility.’ (2) The once majestic hotels had fallen into disrepair and stood deserted, save the few old-timers loitering in near-empty lobbies, prompting Jason to remark contemptuously, ‘Pathetic – half of them don’t know whether they’re standing or sitting.’ Growing old will be a central theme of both films, in part a reflection of the city’s considerable number of senior citizens. Atlantic City at this time had the second-oldest population in the country, after St. Petersburg, Florida; one-fourth of its permanent residents were over the age of sixty (3). Vacant hotels stretched along the Atlantic City waterfront during the 1970s, forming a chain of white elephants (the Brighton, the Traymore) waiting to be unloaded at figures far below their construction costs. Those remaining unsold (the Ambassador) filed for bankruptcy and were sold for dismal prices at federal auction. One by one, each of these Victorian-era landmarks was felled, ‘leav[ing] a vacancy as jarring as missing teeth in a beautiful woman…They told the onlooker that the sky was no longer the limit: it was more often only two stories from the ground.’ (4) Jason calls the Essex Carlton, where he squires a two-room suite by credit of his association with the feared Louis, ‘the oldest and finest accommodation on the boardwalk…Woodrow Wilson used to stay here.’ Now, however, the vast lobby is eerily silent save a single discordant chord struck repeatedly by a piano tuner or the menacing echo of a thug striding down the marbled hall. Similarly, in the neglected hotel where Atlantic City’s high rollers buy Lou’s cocaine, desolate corridors are blocked with stacked chairs and mattresses are leaned against walls. No longer a bucolic getaway, Atlantic City is portrayed as largely similar to urban Philadelphia: both bleak and desolate, both pervaded by corruption and pollution. 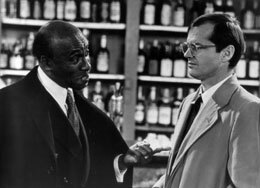 This correlation is emphasized in a sequence towards the end of The King of Marvin Gardens, as David returns to the hotel after his meeting with Louis. A succession of shots show him as he walks from left to right through the frame, in a manner reminiscent of the opening credits’ Philadelphia scene. In both sequences David strides through deserted nighttime streets, hands burrowed in the pockets of his trench coat and his head bent against the wind. During the initial incident that foretells of her final breakdown, Burnstyn’s Sally erupts in hysterics when the hotel’s bathtub tap emits rusty water – ‘You come out dirtier than when you went in!’ she gripes to Jason. Sally’s comment is one which relates to Atlantic City itself, as both Rafelson’s and Malle’s films portray people whose moral character tarnishes and erodes in the city’s salt air. Yet there pre-exists in each character, before crossing the bridge connecting the New Jersey Pinelands to Atlantic City, a component of deceit and corruption. Perhaps for this reason each is drawn to the East Coast’s city of sin. While this predilection is baldly obvious in the characters of Jason Staebler and Dave, both of whom are consummate con men, it is also revealed in the natures of seeming innocents David Staebler, Jessica and Sarandon’s Sally. In the masterful six-minute opening shot of The King of Marvin Gardens (one of the longest close-ups in the history of American film), David delivers a radio monologue in which he recounts how, as children, he and his brother watched passively as their grandfather choked to death on a fish bone. Yet when David (whom we later learn has spent time in what his brother terms ‘the loony bin’) returns home after his radio program we see that his grandfather is alive and well and sharing David’s house in Philadelphia. Though he initially seems to be the decent-hearted yin to his conniving brother’s yang, David’s initial misleading of his radio audience (not to mention the film’s spectators) hints at this subtle propensity for the smooth-talking hustle of Atlantic City. As the film reveals, David shows himself to be highly capable as a confidence man, enthusiastically joining his brother in auctioning junk to an elderly tour group and weaving tales about Tiki to rope in the Japanese investors. 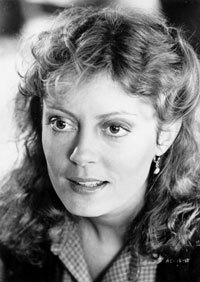 In Atlantic City, Sarandon’s character is trained in the tactics of gambling scams during her croupier lessons: ‘They have a million clever ways of trying to cheat you,’ warns her teacher. Soon afterward, her wallet is stolen right under her nose by the unscrupulous Dave; by the film’s end, Sally herself will pilfer money from Lou’s wallet. Lou himself makes money running small bets for a local mobster and hawking various trinkets (a silver cigarette case) that he’s lifted from Grace, who tauntingly calls him ‘Mr. Mastermind, Mr. Ten Most Wanted.’ Atlantic City, these narratives instruct us, attracts deceit, breeds deceit, even necessitates deceit. Rafelson’s and Malle’s characters are all, to varying degrees, at home in Atlantic City, for each of them possesses that streak of deceit which, as Jason notices, pervades the town. ‘I love all the hustle around here,’ he exclaims. ‘It’s out in the open. Down here everybody’s hustling all the time.’ Surviving in Atlantic City is dependent on deceit; it is inevitable and therefore matter-of-fact, though not without shame. As Jessica tells David, ‘I wish you didn’t think I was a part of all this,’ to which David replies, ‘Aren’t you?’ She answers simply, ‘Of course I am. We all are.’ Jessica goes on to tell David that ever since she became old enough, she and Sally have ‘gone as a team.’ In order to get by in this tough environment both women trade on their looks, a time-honored strategy for Atlantic City women that has been institutionalized along a spectrum, stretching from the city’s numerous vice establishments to the revered Miss America pageant. Not only does Atlantic City compel women to hustle their looks but the stigma of age is magnified in a duality between young and old as strict as that between winners and losers. When succumbing to her defeat against age, Burnstyn’s Sally plaintively pleads to her stepdaughter, ‘I want you to stay as beautiful as you can, as long as you can. Now you’re the meal ticket. You won’t forget ole Sal, will you?’ In Rafelson’s poignant scene of the beach bonfire, a resigned Sally ceremoniously buries her make-up in the sand and then, in a frenzied act of misery, hacks off her hair and tosses long strands into the flames. Perceived to be without beauty or youth, Sally loses her capability for survival and thus becomes a liability – as outmoded and useless as the hotel where Jason plans to abandon her. Like Sally, Atlantic City‘s Grace is a shrill, unstable aging beauty, grasping at her fading identity as an erstwhile big-timer’s widow. Her obstinate protest that ‘I’m still a very important woman in this town. I’m Cookie Pince’s widow!’ is proven otherwise by her reclusion in the crumbling apartment building. A bedridden hypochondriac, Grace is wholly dependent on Lou (once a lackey for her late husband), even as she furiously reminds him of his reliance on her: ‘You work for me, Lou,’ she says bitterly. ‘The cigarette you put in your mouth I paid for.’ This discourse on aging extends to Malle’s male characters, beginning with his casting of two cinematic legends in their twilight years, Burt Lancaster and Michel Piccoli. Lou’s memories of his past, when he ran numbers ‘for the dinosaurs,’ and briefly shared a jail cell with Bugsy Siegel, are nostalgic for Atlantic City’s glory days. ‘Now it’s all so goddamn legal,’ Lou complains, ‘Howard Johnson running a casino.’ Lou’s yearnings are principally motivated by the losing streak of his old age, for in successfully fencing the cocaine he is able not only to buy a new suit but to recapture, albeit briefly, his youth. Reminiscing with a past cohort who now works as a bathroom attendant, Lou tells him that he ‘lives too much in the past.’ Furthermore, Lou’s relations with Sally give him the confidence to answer Grace’s demand of ‘If I’m an old lady, what does that make you?’ with the elated exclamation, ‘I’m a lover!’ Though Atlantic City hands out hard indictments to those on the downswing, it does allow for comebacks. In Rafelson’s depiction of the American Dream in the off-season, Jason’s plans for what he calls ‘the Staebler Brothers’ renaissance’ is for naught – in 1972, it’s too late for dreamers in Atlantic City. Jason is playing a high-stakes game of chance not unlike Monopoly, which is directly referenced in the film. ‘You notice how it’s Monopoly out there? Boardwalk, Park Place, Marvin Gardens…’ Jason asks David from behind bars at the lock-up. ‘Go directly to jail?’ David replies, and Jason plays along gamely, ‘That’s me – don’t pass Go, don’t collect $200.’ Even before its transformation into a gambling town, life in Atlantic City is a game for Jason, with play money and unreal consequences. The irony, however, is that Marvin Gardens is the sole Monopoly property not to be found in Atlantic City – the name refers to a secluded middle-class planned community some distance away from the city proper. Rafelson’s title thus alludes both to the elusiveness and essential vapidity of the ‘kingdom’ which Jason seeks to claim. Though the spatio-temporal atmosphere depicted in each film is unique to Atlantic City, it nevertheless serves as a metaphorical representation of America itself at the beginning and end of the 1970s. The King of Marvin Gardens is shrouded in a post-’60s hangover of regret and defeat, what Thomas Elsaesser terms a ‘pathos of failure’ in his writings on American films of the 1970s. The pessimism and malaise pervading early ’70s American society as a result of the failed peace movement, the faltering economy and revelations of government corruption (namely in Vietnam policies and the Watergate affair) was manifested through a newfound cynicism and ‘post-rebellious lassitude’ in American films of this period (8). Two standout examples are Bonnie and Clyde (Arthur Penn, 1967) and Thieves Like Us (Robert Altman, 1973), both of which revert to a Depression-era setting to illustrate its similarity to the contemporary cultural landscape. Rafelson’s bleak portrayal of desperate living in purgatorial Atlantic City is a stand-in for the country at large, and the film’s conclusion is prescient of the nostalgia and fatalism endemic throughout the decade to come. Even the most worn-down residents retain a paltry hope in hitting the jackpot, making fifty-cent bets with Lou and imploring him, ‘Make me a winner, man!’ In the Frank Sinatra Wing of the local hospital, Robert Goulet sings another rendition (‘Atlantic City my old friend, I’m glad to see you’re born again…’) and a billboard overlooking the boardwalk proclaims, ‘Atlantic City, you’re back on the map again!’ Indeed, boardwalk construction is well underway in Malle’s film, with wrecking balls demolishing the stately Victorian relics in favor of more modern casino resorts developed by Merv Griffin and Donald Trump. This renewed vigor allows for a transformation in the way that Atlantic City is perceived by the films’ characters. Rafelson’s images of the bizarre and downright tacky become merely amusing kitsch in Malle’s film. Witness a shot of the city’s oddest monument, a massive elephant statue, pictured as preposterous in The King of Marvin Gardens but a beacon for Atlantic City‘s hitchhiking hippies Dave and Chrissie, who exclaim joyfully at seeing it upon their arrival. Finally, whereas The King of Marvin Gardens ends in tragedy, Atlantic City‘s conclusion contains a note of hope for the future as Lou and Grace amble together, money in pocket and hand-in-hand. Like the casino patrons to whom it opened its doors, Atlantic City has over its 150-year history enjoyed upswings and endured downswings. In Malle’s final shot, a massive wrecking ball strikes like a pendulum at the slowly crumbling facade of a boardwalk hotel. A bittersweet image, yet the soundtrack provides another tone by rapidly switching among tunes (Bellini’s Norma, the boardwalk melody, Robert Goulet’s crooning, a mod jazz score.) It is a progression which is discordant yet anticipatory, much like Atlantic City’s checkered history and uncertain but infinitely hopeful future.